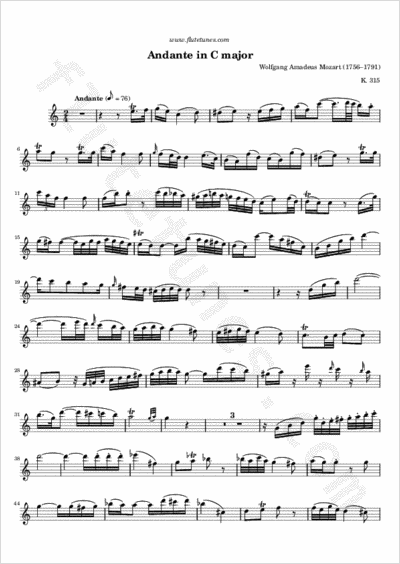 The famous Andante for Flute and Orchestra (K. 315) in C major was written by Wolfgang Amadeus Mozart in 1778. It was commissioned by wealthy amateur Ferdinand De Jean as a possible replacement or alternative second movement for the “Adagio ma non troppo” from Flute Concerto No. 1 (K. 313). The two pieces are quite different both in length (the original Adagio lasts about 10 minutes, twice the time of this new Andante) and in the importance of the orchestra: while in the original movement it has a very prominent role, in this Andante it simply supports the solo. The two pieces share the same orchestration (strings, two oboes and two french horns) and the same structure (sonata form without repeats). Our suggestion for the tempo is eighth note = 76; however, some major players have recorded the work at much different tempos, both faster and slower. If you do some research, you may find recordings of this piece at almost any tempo from 66 to 96 BPM.